Self-esteem has never been my thing, and a girl I was dating during a particularly annoying (both to myself and others) downswing said something memorable to me: "If you keep telling me what a loser you are, eventually I'm going to start to believe it." 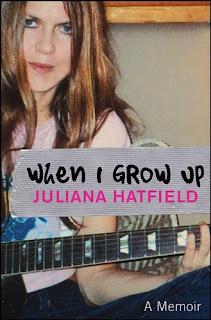 Well, Juliana Hatfield spends a lot of When I Grow Up: A Memoir telling us that she's probably not the sort of person we'd actually like to get to know, and I'm now inclined to believe it. It's a little hard to take, given that she's been my absolute favorite musician I first saw her in concert back in 1993, and that I've harbored a crush on her for all that time as well. And while it's easy to tell from just a cursory listen to the lyrics of any given album that she's a big ol' saddo, this look into her life and psyche makes it pretty clear that even on her best days, she's probably more than a little miserable. Don't get me wrong, the book certainly has its interesting moments, since you're really getting 2 books in 1 here. Half of this is a look into the life of a journeyman, "kinda famous for a minute about 15 years ago" musician on tour. And while she may get a little too bogged down in the details sometimes (at some points recounting individual food choices), it's a unique chance to look into a life completely foreign to me. The other half of the book has the more traditional biography elements, and this is a real mixed bag. We get a lot of information about what it was like to be a female rock musician at a point in time when "girls with guitars" were The Big Thing, discussions of her influences, family life, and a surprisingly in-depth chapter on how the Telecommunications Act of 1996 changed the face of music forever, and that's all fine reading. But there are some surprising gaps, too... one chapter tells about the formation of the Blake Babies, and by the next, they've already broken up. And that's the most glaring example, but there's lots of other little seemingly important pieces missing... not as much "there" there as should be. I'm sure she had her reasons, but these are oddly glaring omissions to say the least. In short, a decent read at times, a dull slog at others. I think the lesson here is "it's often better not to know what's going on the heads of the people you admire most." I, for one, preferred the illusion.